I just finished a 1200 yard order of Navajo plied (chain plied) natural colored Jacob Sheep yarn – spun to an even grist – not lumpy, bumpy or clumpy! 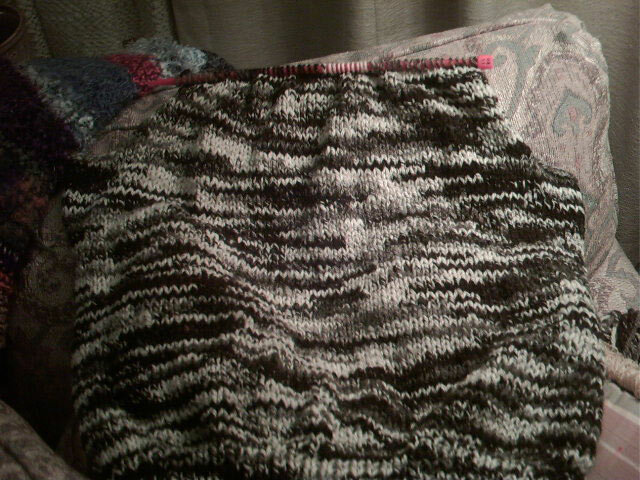 As much as I enjoyed this spinning project, I was feeling the urge for some yarn with colors and clumps. As things work, I was asked to put together a selection of bulky, highly textured yarns right when I was thinking about something less uniform. I recently purchased a couple of pounds of a lovely Blue Face Leicester fleece from Brenalan Farm in Oregon. Just the fiber for some fun spinning and dyeing. Since I wanted to dye small quantities in a number of different colors, I used my favorite method of getting a lot of colors quickly. 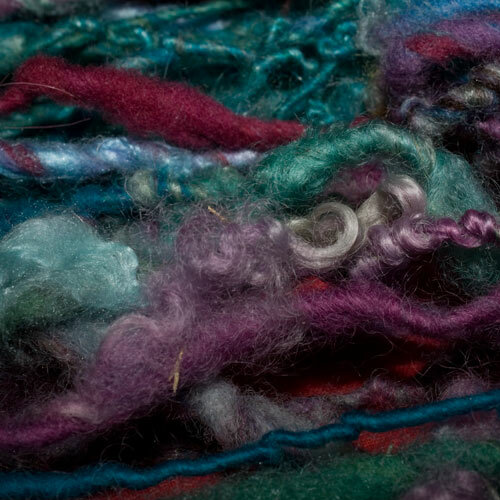 Fiber is first soaked in warm water with a splash of synthrapol. 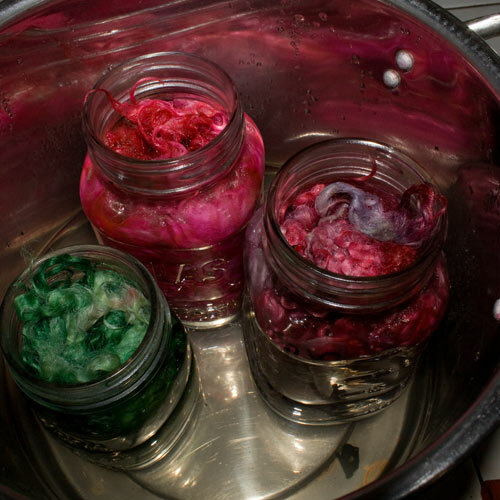 An appropriate measure of dye powder is added to hot water (fill about 3/4 full) in a canning jar. Stuff in as much fiber as you want or can. You can get a lot more fiber in there than you’d think! After filling the jars just think hot water canning, but you don’t have to worry about botulism so just put in “some” water in the pot, bring to a fast simmer with the pot covered. Reduce to low simmer. Simmer until you remember to turn it off. If you think it might take you more than two hours to remember, make your “some” water 1/2 way up the jars. I usually forget :-). If you keep track of time better than I do, hold at a low simmer for 30 minutes. Turn off heat. Leave until everything is cool – usually overnight. 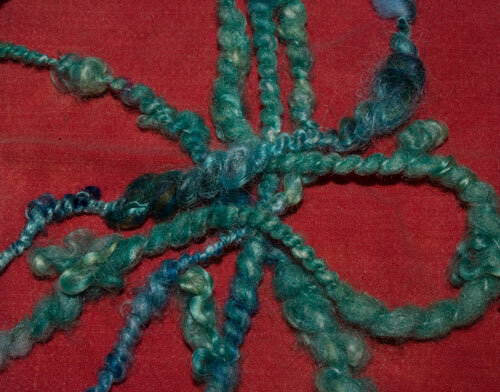 This was spun from lightly hand teased BFL locks and then felted in the washing machine. It was fun and I’m keeping this for me. Tufts, tangles, and twists. 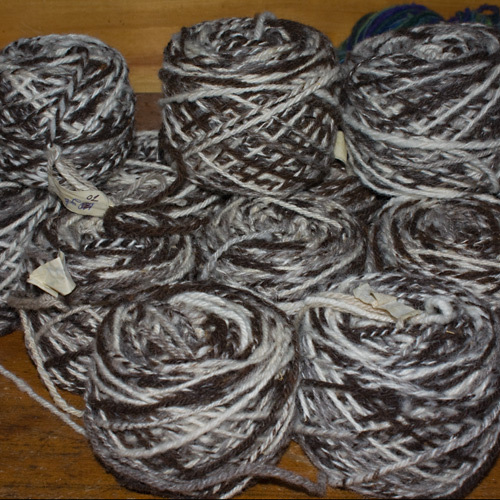 Well, the request was for highly textured yarn! 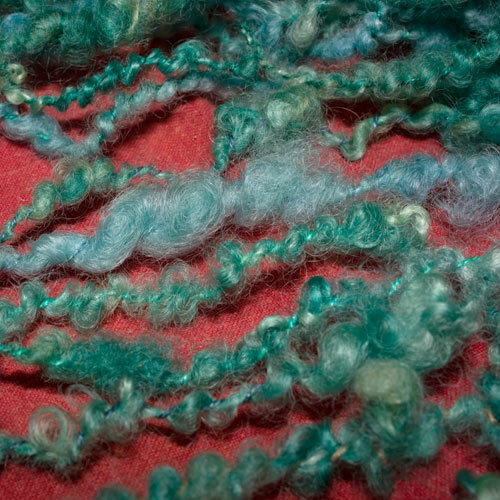 Your bfl locks have such a rich color and lovely sheen! Just beautiful! Wow, you may not know how to knit, but you sure can spin 🙂 Those are so much fun! 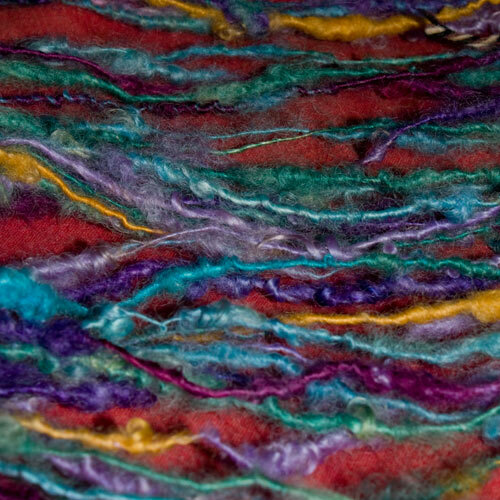 Love the colors – what dye do you use?